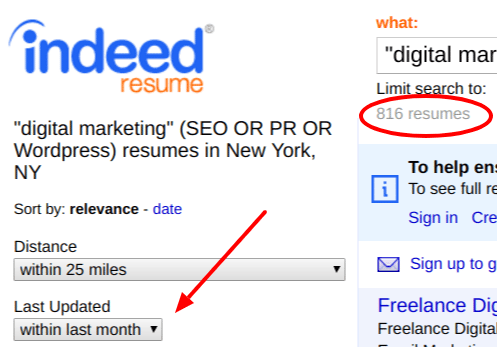 Indeed resume search is a feature of Indeed.com that lets employers and recruiters do a free search of over 25 million resumes. It’s a great way to search for passive candidates. While the resume search is free, you’ll need to pay $100 per month for a subscription that lets you contact up to 30 candidates directly through Indeed. In this guide, we’ll show you how to search for resumes on Indeed and explain their sorting and filtering options so you can find the best candidates fast. We’ll also share an email template for contacting potential candidates once you’ve found them. Getting started recruiting on Indeed is very simple. 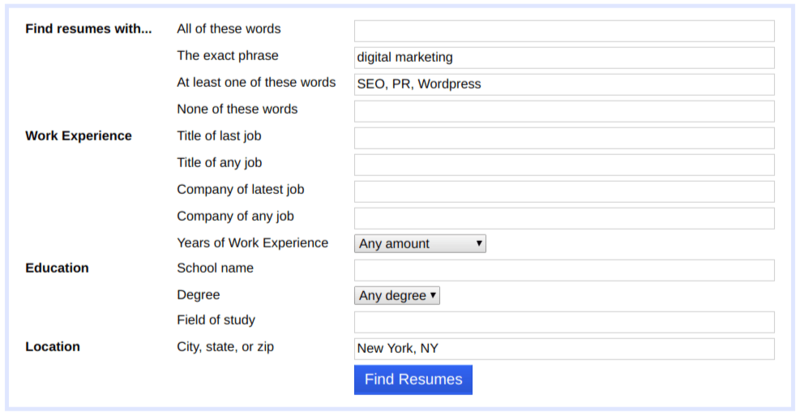 We at Fit Small Business recently filled a digital marketing position using Indeed, so we’ll show you how we conducted our own resume search as an example, following the steps below. Although anyone can search for resumes on Indeed, you’ll need an Indeed account to see candidate names and contact the candidates you like. It’s free to create an employer account, and as part of sign up, you can also claim a $50 credit for posting a job. A best practice is to create a specific business email address to use for hiring so that candidate emails don’t fill up your regular email account. Consider something like ‘jobs@companyname.com’. From the homepage of Indeed, click “Find Resumes” in the upper left corner menu bar. Then enter a keyword and location. It’s that easy. You can also search by job type, education level and location as we will show farther down in this article. However, for our open position at Fit Small Business, we initially searched using the words “digital marketing” in New York City. Right off the bat, we found over 12,000 potential candidates. This included all resumes with “digital” and “marketing” in the title or body text of the resume, and only those who reside within the ‘default’ of 25 miles from our location. This, obviously, is way too many to sort through. Instead, we narrowed it down using Indeed’s advanced search, which we cover in the next step. 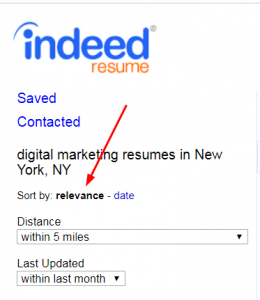 Advanced search is the best way to target specific job seeker resumes on Indeed. It allows you to search millions of current online resumes for specific words, phrases, job titles, companies, years of work experience, name of school, degree, field of study, and location. Maybe you aren’t getting enough applicants to your job posting or want more control over finding good candidates. Indeed allows you to source your own candidates that match your job description, making it way more affordable than contacting them using social media tools like LinkedIn InMail or Recruiter. Once we selected advanced search, we searched for the exact phrase “digital marketing” in our example. This rules out candidates who have marketing experience, but not digital marketing specifically. This returned fewer resumes, but 8,000+ is still too many to read through in an afternoon — even if we sorted them by date. To narrow down our results to a manageable number, we used Indeed‘s filtering tools. The filter options are listed in the left-hand column after you make a search. Distance – Within how many miles (from 5 to 100) of your city do you want to search for applicants? The last thing you want is to get excited about a candidate who winds up having an unrealistic commute to your office (this filter may be irrelevant if you hire remote staff however). Last Updated – Shows resumes that have been updated in the last day, week, month, or all resumes regardless of how old they are. Job Type – Choose to view only resumes for people looking for full time, part time, contract, internships or even commission-based jobs. Job Title – Indeed will show you the range of job titles that came up during your search, such as “Marketing Director” and “SEO Specialist.” (Indeed also has a job trends search tool.) This can be helpful if you’re looking for people who have held specific roles, and allows you to find candidates even if the job title they use isn’t the same exact title you searched for. Years of Work Experience – Filter candidates based on their years of work history. But be cautious. Indeed adds work experience together – for example one year of digital marketing plus five years of shoe sales = 6 years. Education – Indeed allows you to filter candidates based on their education level, from high-school diploma through doctorate degree. Companies – Indeed will also list past companies that candidates worked at. You can identify candidates who have worked in similar businesses or in industries where you want to recruit from. Using “advanced search” is another way to find specific companies. We set the distance to 5 miles. New York City is a big place and our candidates will likely need to be within the 5 boroughs to be within commuting distance. We left “last updated” to within last month so we’d likely get job seekers who are still available. We looked only for those who want full time work. We wanted them to have at least 3 years of experience. We wanted only those with a bachelor’s degree. While Indeed tends to have mostly up-to-date resumes, they can be a few months, or even a few years old. You’re far more likely to hear back from a candidate who uploaded their resume more recently. And notice that you can see which resumes are most recently updated in orange text. Ultimately, after the filtering, we had 68 resumes to search through — sorted by those most relevant first. Perfect! 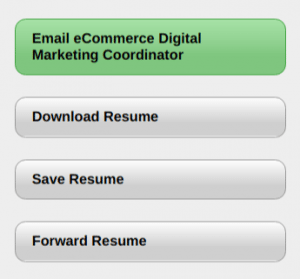 Indeed makes it very easy to scan through resumes at a glance. As you hover over each candidate’s name, a preview of the individual’s work history will pop up. Indeed will automatically highlight your keywords within their resume, so you can immediately identify your top picks. Clicking on a “View Full Resume” link will bring you to the full resume which you can save, forward, or download for free. However, you’ll notice no contact information is provided. The only thing you can’t do for free is contact the candidate through Indeed. So, on to the next step! So you’ve found the perfect candidate, but now comes the tricky part. How do you reach out to them? Indeed offers resume search packages that start at $100 per month if you want to reach out to candidates you’ve found through Indeed or obtain their contact information. 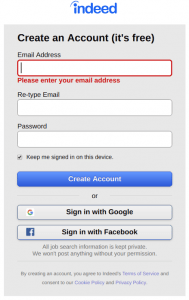 To contact them, click the button on the right-hand side of the screen. You will be asked to complete your registration if you haven’t already created an account, and provide payment information based on the subscription you choose. For example, the standard subscription allows up to 30 contacts per month for $100, or you could upgrade to the premium subscription to contact up to 100 job seekers for $250 per month. A recruiting message is like a cold sales email. Since the person hasn’t applied to your company, they’re considered a passive candidate. You want to grab their attention quickly, and offer a simple way to follow up. So personalize your email. Like a sales email, it’s easy for candidates to pass it off as spam, or think it’s an ingenuine mass email. Instead, point out specific areas of their resume that sparked your interest, and describe the job in a way that may catch their attention. See our example below. I am an employer and came across your resume on Indeed today. Your previous work history sparked my interest. In particular, I noticed that you [point out specific skill or experience that may be relevant to your job opening]. I was wondering if you have a phone number or email address so I could contact you about [describe job opportunity here] we have in our company. We’re [explain company in 1 sentence]. We provide our employees [explain unique benefits, like flexible hours or unlimited vacation time]. Generally speaking, avoid mentioning compensation in the initial email. You’re better off to negotiate salary later on after you learn more about their qualifications and can determine whether they are a good match for your open job role. If you don’t want to pay to contact the candidate through Indeed, or don’t hear back from the candidate in a couple of days, consider following up on LinkedIn as an option by searching for the candidate by name. Although Indeed messages are sent to the their personal email address, candidates may miss the email, or mistake it for spam. Hubspot explains how to send a LinkedIn message to somebody you’re not connected to using InMail, which is just one of many recruiting strategies you could use. Not all candidates will respond, but it’s worth reaching out this way so that potential candidates realize your first message wasn’t spam, and you increase your chances of getting a reply. 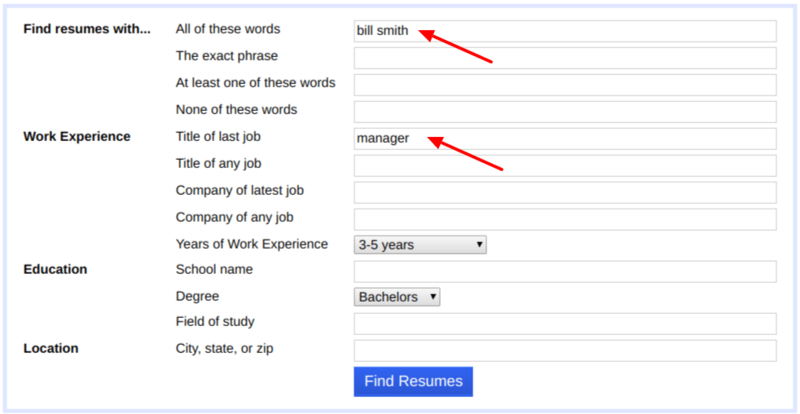 The easiest way to search for a specific person’s resume on Indeed is to use the “advanced search” feature. Key in information about the individual, such as name and location. Indeed will search the text of all resumes to find ones that match this exact criteria. You may want to use this type of search if someone suggested you talk to a candidate, and you want to learn more about them by looking for their specific resume online. Once you get a short list of results, you can scroll through the resumes to see which resume belongs to the exact person you’re looking for. So you’ve identified and contacted your top candidates. What next? When a candidate responds, the first thing you should do is set up a quick 10 minute phone call, Google Hangout, or Skype interview. You should be able to determine pretty quickly if the candidate is a good match. This phone/video conference screening will save you time, compared to scheduling every candidate for a full interview. From there, select only your top 3-5 candidates and invite them to an in-person interview. Indeed resume search is a powerful tool to find specific talent that fits your exact criteria from location to education. With over 2 million resumes added each month, it’s easy to find relevant candidates who are currently looking for a new job. That’s often a lot easier than waiting for applicants to apply to your open positions, or trying to convince a good candidate to leave their current job! If you’re ready to hire, why not accept the free $50 credit to promote your job notice on Indeed? You can save the credit to use at your discretion later, since posting a job on Indeed is free. Now that Indeed has eliminated the names to be viewed, have you or can you offer a workaround? Hi Stephanie, as of March 2018, Indeed began charging a membership rate if you want to contact job seekers through their site. You can still search resumes for free, but if you want to contact the job seeker, there’s a charge. The standard subscription allows up to 30 contacts per month for $100, or you could upgrade to the premium subscription to contact up to 100 job seekers for $250 per month. You can view thousands of resumes for free, and then contact only the few that seem to fit the job. Another workaround (it’s a bit of work) is to look for the candidate based on their prior job and company on LinkedIn, and contact them that way if they’re in your network, or if you can get an existing LinkedIn contact to help you make a connection. All these sites, including LinkedIn are moving to fee-based contacts. For example, you can view all their job seeker data and resumes, but if you want to send the candidate a message (get access their email address), you now have to pay for that option. How long do you have to sign up for Indeed. Say I have found an employee or the $100 is not In the budget for this month how long would I have to keep the account. Here’s the good news. Joining Indeed is free. You can post jobs for free, so there’s no need to delay joining. Let’s say you have no money this month. No worries, go ahead and post the job, but don’t advertise it (Indeed calls that Sponsoring). Then let’s say you want to advertise the job next month … maybe set a sponsoring budget of $5 a day. Either you’ll spend the $100, or let’s say you hire someone after day 5, you’ll stop sponsoring, and only owe $25. If next month, you have no job openings, you still can keep the account (no cost). So you never have to shut down the account. Take a look at this article, and you’ll get a free $50 toward sponsoring your first posting. Just having an account costs nothing. Question how is the mileage broken now in resume search? How specific can I ask? Indeed resume search lets you narrow down candidates in the following distance increments, 5 miles, 10, 15, 25, 50 and 100 miles from the location you input into the ‘where’ field. To get really specific, don’t put in a town name when you’re searching for job seeker resumes, but instead put in the zip code of the work location and that way it will locate candidates within 5, 10, 25 miles of that specific zip code. If you are looking to find out if a person has a resume on Indeed.com, is there a way to look up an individual? Yes and no. You CAN type a name into the keyword search bar, however, Indeed will scan the full document for the keyword, including work experience, including resumes, work experience, etc.